NASA detected a coronal mass ejection from the Sun which may cause mild to moderate effects on instruments on Earth. A coronal mass ejection (CME) happens when the sun releases magnetic energy into space. It is a massive burst of solar wind and magnetic fields coming from the solar corona (the Sun's plasma-type atmosphere). Billions of tons of solar particles are ejected during a CME and when these reach the Earth can cause geomagnetic storms that may disrupt electronic instruments, satellites and even power grids on the planet. Not all CMEs affect the Earth. It all depends on the trajectory of the solar particles . The speed on which coronal mass ejection reach the Earth differs from solar flares. Solar flares travel at the speed of light and reaches the planet in eight minutes. CMEs are not made of light and usually takes one to three days before reaching the Earth. 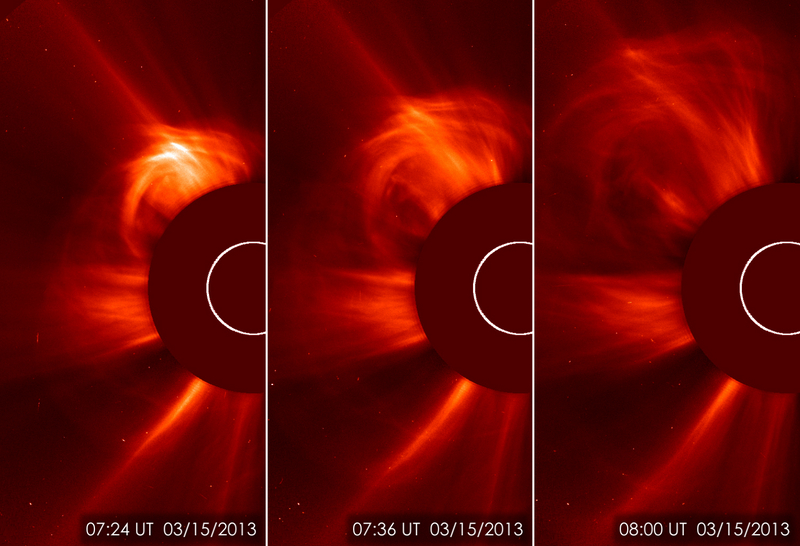 On 15 March 2013 at 2:54am EDR, a CME was detected by the ESA and NASA Solar Heliospheric Observatory (SOHO). Particles detected during this CME show that it is travelling towards the Earth at around 900 miles a second and may cause mild to moderate effects on the Earth. NOAA's Space Weather Prediction Center is the United States Government official source for space weather forecasts, alerts, watches and warnings.